Special Olympics Texas (SOTX) and the Law Enforcement Torch Run (LETR) teamed up with Norma’s Café on Wednesday, May 10 from 8:00am-2:00pm for the fifth annual Tip A Cop fundraiser. 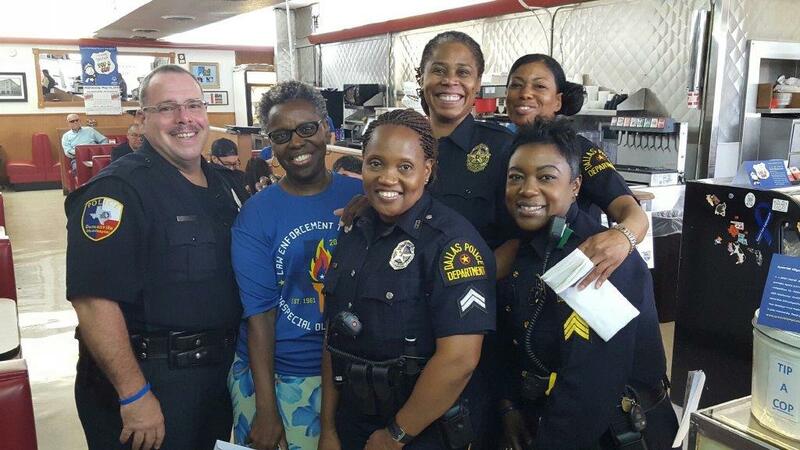 Members of the Dallas, Duncanville and Frisco Police Departments, along with Dallas County Constables and Texas Department of Public Safety Officers served Norma’s Café customers at all four of the chain’s locations to raise awareness for local Special Olympics Texas athletes. Officers served tables and collected tips, which were donated to SOTX at the end of the shift, to support programming and training for more than 7,200 children and adults with intellectual disabilities in the Greater Dallas Area. A portion of the day’s sales will also be donated to the organization. The Dallas Police Department would like to thank everyone who participated by donating their time and/or money to this worthy cause. If you are interested in participating in upcoming Special Olympics fundraisers/events, please email terri.clark@dpd.ci.dallas.tx.us.